Here comes a great deal from Sun Cellular postpaid plan, they offer another Samsung Edition of their Sundroid Rush that you surely like. 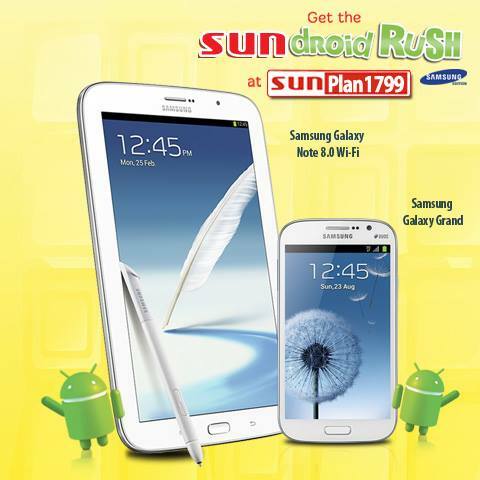 This time its Samsung Galaxy Note 8.0 Wi-Fi tablet paired with Samsung Galaxy Grand offered free on their Sun Plan 1799. After they offer two Windows Phone which is Nokia Lumia 520 and Nokia Lumia 720 they now bounce back to their hit Sundroid Rush plan. The Galaxy edition I think captures their subscribers for the fact that they are offering two Samsung devices in one affordable plan. Their previous offers on Sundroid Rush Samsung edition is the Galaxy Tab 7.0 paired with Galaxy Y under Sun plan 999. Knowing the price of this 2 Samsung devices compared to this plan offer, Sun Cellular did a great deal plus their bundled network services. You do have an option if you want only Samsung Galaxy Grand, they offer this device under Sun Plan 999 with a difference of P800. These two gadgets are also available under Sun Cellular Plan 1999 for free that gives you unlimited Sun calls and texts, unlimited mobile internet, 250 SMS to other networks and 60 minutes IDD calls.